According to the website Reachout, the definition of cyberbullying is "Any kind of bullying or harassment done using technology." Given how fast the Internet community is growing, cyberbullying is becoming more and more of a problem worldwide. The popular youtuber Dan Howell (danisnotonfire) has recently started a campaign against cyberbullying, including making collaboration videos with loads of other youtubers and a Twitter hashtag- #nicerinternet. There will be free drinks and a barbecue meal for all who attend. There will be speeches by our various youth workers and some of our Senior Children. Cyberbullying is a form of bullying which is carried out through an internet service, mobile phone or other electronic device. If you are being bullied and need support, it is important that you read this factsheet and go to the Get Help section. If you know or see someone being bullied go to the Supportive Bystander FactSheet to find out how to help them. Cyberbullying is bullying that is done through the use of technology. 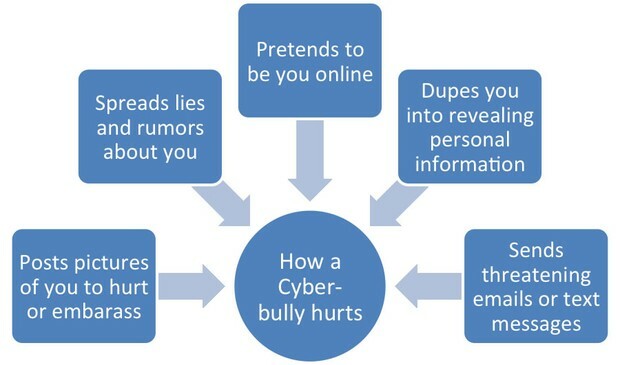 For example, using the Internet, a mobile phone or a camera to hurt or embarrass someone is considered cyberbullying. It can be shared widely with a lot of people quickly, which is why it is so dangerous and hurtful.